Stillwater, Texas. The town in Melissa Lenhardt's first Jack McBride mystery is as bleak and dark as it sounds. But, McBride isn't one of those perfect saints, a lawman who comes into town to clean up the place. McBride's brooding, angry personality fits Stillwater. Former FBI agent Jack McBride took the job of police chief, moving to Stillwater with his thirteen-year-old son, Ethan. Both McBrides are angry. Jack's wife, Julie, walked out on them on Ethan's birthday, and Jack's been covering for her for a year. Ethan, on the other hand, is a typical teenage boy, rolling eyes at his father, and blaming him that his mother is gone. And, it turns out Stillwater isn't the sanctuary either of them want or need. It's a town where everyone knows what you're doing, and the retired sheriff, who controlled the town, knows enough about Jack and Ethan to make their lives difficult. Stillwater should have been a quiet place. Instead, on his first day as police chief, McBride has to deal with the apparent murder/suicide of a Mexican couple, illegal immigrants. He's ambushed while transporting a prisoner, and his car is set on fire. Within the same week, a skeleton is found in the woods, and McBride finds himself attracted to a smart woman, too smart to want to get involved with a married man. Every move McBride makes seems to land him in more trouble as he digs up buried secrets, exposing the town's past. It's not normal for Stillwater, where "Too many people were willing to sweep the town's problems under the rug and pretend they didn't exist." Lenhardt's mystery is about characters; angry ones, crooked ones, complex characters with histories they want to keep hidden. It's about a small town ruled by secrets, tied together by history, and, in some cases, determined to keep the past buried. Perhaps only a man as angry as Jack McBride could take on the people who hid the town's stories. Stillwater, the first Jack McBride mystery, introduces a brooding, moody man, but a man determined to find the truth. Perhaps McBride's future, and the future for the town, won't be as bleak after secrets and lies are exposed. 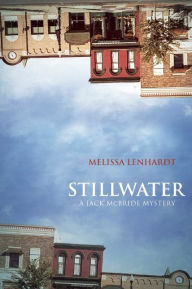 Stillwater by Melissa Lenhardt. Skyhorse Publishing. 2015. ISBN 9781634502269 (hardcover), 298p. After reading A Man Called Ove, I couldn't do another moody man :-) even though I did enjoy him towards the end. I don't blame you, Marce. I'd read this first to find out how the sheriff and his son cope with the wife, mother being gone and what that is all about.